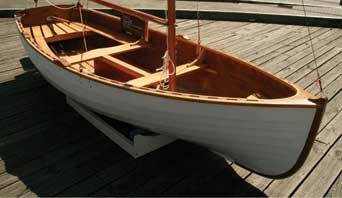 Mackeral is a skinny dory perfect for rowing, easily built compared with say the Acorn range. Not nuts about sailing Dories, but Iain does have a dagger board and optional standing lug, spit or gunter rigs for you to use, at your peril. Crew: 4.67 m - 15' 3"
1.22 m - 4' 0"
A bit more beam and more weight than Mackeral for the same length tilts this one a bit more to sailing. I think there is one in Australia, maybe there are more, but that's possibly an indication. 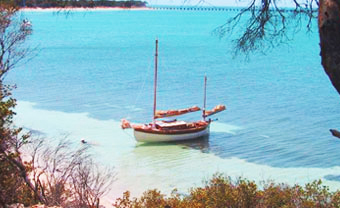 Still a lot of people like the traditional links of Dories. 1.30 m - 4' 3"
The Amberjack has the second chine that is the indicator of the Swampscott type so favored of the corn cob pipe smoking Eggamoggin Reacher types, up there in Maine. There's a few here in OZ too, people like the compromise dory style, with their handier sailing ability and still very good rowing and load carrying potential. Sprit or gunter rigs are offered, like her two smaller dory sisters, this boat may be car topped. 1.41 m - 4' 7"